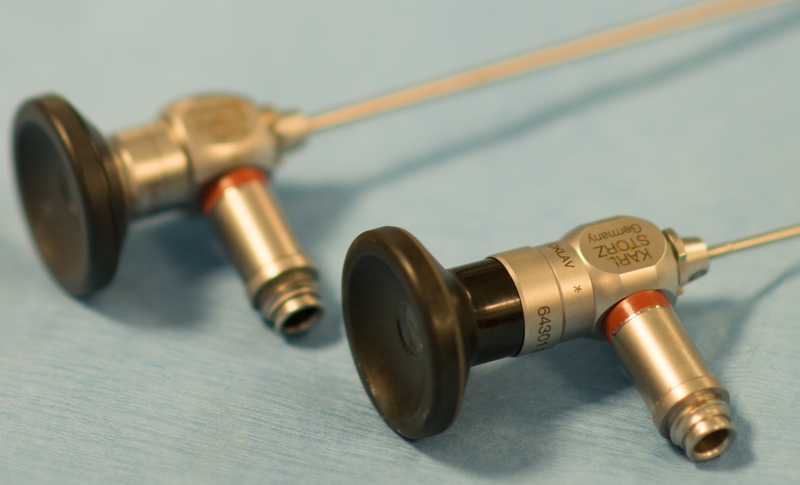 The rigid endoscopes or arthroscopes available in our clinic range from 1.9mm to 4.0mm wide. This allows access into even the smallest joints. Although technically demanding, we have performed arthroscopy in dogs as small as Jack Russell terriers and even in cats. Arthroscopy has been shown to reduce morbidity in patients, meaning they are more comfortable and less debilitated after this procedure compared to an ‘open’ approach. The magnification from the arthroscope allows more detailed assessment of cartilage and intraarticular structures. The surgical incisions are small, leading to more rapid wound healing. Complications are rare with this technique provided the high level of experience of the surgeon. Our specialists have both been performing arthroscopic surgery for over 10 years and have marked experience in carrying out and teaching this technique.